HOS regulations determine when and how long you are allowed to drive a commercial motor vehicle (CMV). This is accomplished by placing specific limits on the number of hours you can drive or be considered on duty. The rules also specify how much time you must remain off duty before you can legally resume any driving duties. And finally, the regulations dictate when breaks are required during your workday. The 14 hour on duty limit. The 11 hour driving limit. The 60/70 hour on duty limit. This limit is usually thought of as a "daily" limit, even though it is not based on a 24 hour period. You are allowed a period of 14 consecutive hours of on duty time after being off duty for 10 or more consecutive hours. The 14 consecutive hour on duty period begins when you start any kind of reportable work (performing vehicle maintenance, loading / unloading cargo, fueling, driving, etc.). Once you have reached the end of this 14 consecutive hour period, you cannot drive again until you have been off duty for another 10 consecutive hours. Your driving is limited to the 14 consecutive hour on duty period even if you take some off duty time, such as a lunch break or a nap, during those 14 hours. The above image is an example of a drivers daily log. Let's try to further understand the 14 hour on duty limit using this example. You began working at 6:00 a.m. (vehicle inspection, fueling, loading / unloading freight, etc.). That makes 6:00 a.m. your starting calculation point for the 14 hour on duty limit. You must not drive your truck after 8:00 p.m. that evening (14 hours later). You may do other work after 8:00 p.m. (load / unload freight, perform maintenance duties, etc. ), but you cannot do any more driving until you have taken 10 consecutive hours off duty. Once you have taken 10 consecutive hours off duty, your 14 hour limit will start over as soon as you go back on duty. During the 14 consecutive hour on duty period, you are only allowed to drive your truck for up to 11 total hours. Once you have driven a total of 11 hours, you have reached the driving limit and must be off duty for another 10 consecutive hours before driving your truck again. After taking 10 consecutive hours off, you begin work at 6:00 a.m. and drive from 7:00 a.m. until 7:00 p.m. with a one hour break from noon to 1:00 p.m. (total of 11 hours driving). You cannot drive again until you have accumulated at least 10 consecutive hours off duty. You may do other work after 7:00 p.m., but you cannot do any more driving of a CMV. In the above example, the driver first went on duty at 10:00 a.m. which becomes the starting calculation point for the 30 minute break requirement. The driver must take at least a 30 minute break by 6:00 p.m. (8 hours later) in order to continue driving a CMV. If a break is not completed by 6:00 a.m., no driving can legally be done. The driver can perform other on duty tasks, but cannot drive. In this example, however, a 30 minute off duty break was taken from 6:00 p.m. to 6:30 p.m. so the driver was legally allowed to continue driving. Finally, you have the 60/70 hour limit. This limit is based on a 7 day or 8 day period. This limit is sometimes thought of as a "weekly" limit. However, this limit is not based on a "set" week, such as Sunday through Saturday. The limit is based on a "rolling" or "floating" 7 day or 8 day period. The oldest day's hours drop off at the end of each day when you calculate the total on duty time for the past 7 or 8 days. For example, if you operate on a 70-hour/8-day schedule, the current day would be the newest day of your 8 day period and the hours you worked nine days ago would drop out of the calculation. If your company does not operate vehicles every day of the week, you are eligible to use the 7 day / 60 hour limit. By using this limit, you are not allowed to drive after you’ve been on duty for 60 hours during any 7 consecutive days. Once you reach the 60 hour limit, you will not be able to drive again until you have dropped below 60 hours for a 7 consecutive day period. You may do other work, but you cannot do any more driving until you are off duty enough days to get below the limit. Any other hours you work, whether they are for a motor carrier or someone else, must be added to the total. If your company operates vehicles every day of the week, you will use the 70 hour / 8 day schedule. This means that you are not allowed to drive after you've been on duty for 70 hours in the previous 8 consecutive days. Once you reach the 70 hour limit, you will not be able to drive again until you have dropped below 70 hours of accumulated on duty time for the previous 8­ consecutive day period. You may do other work, but you cannot do any more driving until you drop below the limit. Any other hours you work, whether they are for a motor carrier or someone else, must be added to the on duty total. On the first day the driver had a fresh 8 day / 70 hour limit. As the driver spent time on duty each day, the remaining time on the 70 hour limit began to dwindle. By day 7, the driver had used up the entire 70 hour limit. But notice on day 8, the driver went on duty for 5 hours even though no time remained on the 70 hour limit. That is perfectly legal as long as no driving took place. The 70 hour limit simply states a driver may not operate a CMV if the driver has been on duty in excess of 70 hours within an 8 day period. You will also notice on day 9, the driver had 5 hours of the 70 hour limit returned. That's because day 1 no longer counts against the 70 hour limit (you are only required to count the current day and the previous 7 days for 8 days total). Since the driver had -5 hours available and 10 hours fell off the calculation, the driver had a total of 5 hours available on the 70 hour limit. That means, on day 9, the driver could operate a CMV for up to 5 hours. The regulations allow you to "restart" your 60 or 70 hour clock calculations after having at least 34 consecutive hours off duty. In other words, after you have taken at least 34 hours off duty in a row, you have the full 60 or 70 hours available again. You would then begin counting hours on the day of the restart and not go back the full 7 or 8 days. The 34 hour restart must include 2 periods between 1:00 a.m. - 5:00 a.m.
You may only take one 34 hour restart per week. We will now show you 2 examples of 34 hour restarts. One example is complete and the other is not. In the below 34 hour restart example, we can see that the driver took 34 hours off duty starting at 7:00 p.m. on the first day and went back on duty at 5:00 a.m. the third day. This satisfied not only the 34 consecutive hour off duty timeframe, but also satisfied the two required off duty periods between 1:00 a.m. - 5:00 a.m. (the second and third day). This is a legitimate 34 hour restart and the drivers 60 / 70 hour limit would reset on the third day at 5:00 a.m. In this example, the driver completed 34 consecutive hours off duty, but this restart is still incomplete. The driver only spent one period of time off duty between the hours of 1:00 a.m. - 5:00 a.m. That means the 34 hour restart is incomplete and the drivers 70 hour limit has not reset. In order to make the below example a complete 34 hour restart, the driver could have either gone off duty at 1:00 a.m. on the first day or remained off duty until 5:00 a.m. on a third day. There will be explanations about these limits further down the page. It is very important to fully understand each one as these are the main rules you'll need to abide by on a daily and weekly basis. We are going to ask some questions about the 14 hour on duty limit. Remember, once you start any kind of work, your 14 hour limit starts counting down for the next 14 consecutive hours. Even if you take a break, that limit still counts down. By the time that 14 hour limit reaches zero, you must stop driving until you take 10 consecutive hours off (there are a couple exceptions but we'll get to that later). We will ask you questions about the 11 hour driving limit, so make sure you know it. Unlike the 14 hour on duty limit, the 11 hour driving limit does not count 11 consecutive hours. It only counts actual driving time. Anytime you stop driving, your 11 hour clock stops as well. The 11 hour clock will then resume when you begin driving again. Once your 11 hour clock or your 14 hour clock hits zero, you must stop driving. You will not be asked any questions about the 7 day / 60 hour limit. The 7 day / 60 hour limit is normally used by local truck drivers. If you plan on driving locally, you should understand this rule. But for those of you who are planning on becoming OTR truck drivers, simply read this over and pay more attention to the 8 day / 70 hour limit. This is important and we have included a few questions about this in the quizzes. 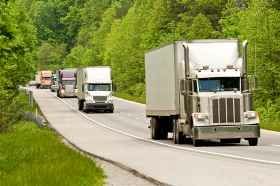 If you plan on driving as an OTR truck driver, you will need to know this rule. Quite simply, if you have accumulated more than 70 hours of on duty time in the past 8 days, you are not allowed to drive. This is also important and we will ask you about this in some test questions. In simple terms, if you take 34 consecutive hours off duty, your 60 / 70 hour limit will reset. By taking a 34 hour restart, your 60 / 70 hour clock starts completely over again with day one. You will notice that all time is counted against the 14 hour limit. The 1 hour spent off duty still counts against your 14 hour limit because the 14 hour limit is consecutive hours, not just on duty hours. We'll explain what is considered "reportable work" a bit later. In this example, and all other examples throughout the section, you can assume at least 10 consecutive hours of off duty time occurred before the start of the example. Notice the 1 hour of off duty time does not count against the 11 hour driving limit. The 11 hour driving limit only includes driving time - unlike the 14 hour limit which counts 14 consecutive hours regardless of duty status. Once again, we will assume that at least 10 consecutive hours of off duty time occurred on the previous day leading into the current example. What is a 34 hour restart? 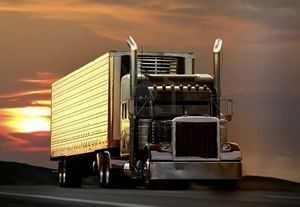 If you are planning to become an OTR truck driver, you will use the 8 day / 70 hour limit. That means, you are unable to drive once you've been on duty for more than 70 hours within an 8 day period. If you've worked close to that limit, you may want to "reset" the 70 hour limit. The only way to completely reset your 70 hour limit is to take an extended amount of time off duty. If you take 34 consecutive hours off without driving or performing on duty tasks, your 70 hour limit will reset. Which statement below accurately describes the 11 hour driving limit? After taking 10 consecutive hours (or more) off duty, you will have a fresh 11 and 14 hour clock. As soon as you begin working (pre-trip inspection, fueling, loading / unloading cargo, driving, etc.) your 14 hour clock starts. Within those 14 hours, you are allowed to actually drive for 11 of those hours. The remaining 3 hours can be used for other non-driving duties (loading / unloading cargo, performing maintenance duties, etc.) as well as taking breaks. The 11 hour clock will only count down if you are actually driving. In other words, the 11 hour clock can be paused. So if you want to take a 30 minute break for lunch, you may do so and stop the 11 hour driving limit. However, your 14 hour clock can't be stopped. If you reach the end of your 14 hour day and still have driving time remaining on the 11 hour clock, you still must stop driving. After 14 hours since you started your day, or after 11 hours of driving (whichever comes first), you can't drive again until you've taken 10 consecutive hours off. What is the 8 day / 70 hour on duty limit? If your company does operate vehicles every day of the week, your employer may assign you to the 70-hour/8-day schedule. This means that you are not allowed to drive after you've been on duty 70 hours in any 8 consecutive days. Once you reach the 70 hour limit, you will not be able to drive again until you have dropped below 70 hours for an 8 consecutive day period. You may do other work, but you cannot do any more driving until you get below the limit. Any other hours you work, whether they are for a motor carrier or someone else, must be added to the total. The 8 day / 70hr limit will restrict how much time you're allowed to be on duty during an 8 day period. So if you take a 10 hour break to reset your 11 and 14 hour clocks, but have been on duty / driving for 65 hours in an 8 day period, you will only be able to drive 5 hours. We'll give you some more examples later on in the program. This can be a little difficult to understand, but try to understand the differences between the 11hr, 14hr, and 70hr clocks. There will be times when you must take a minimum of a 30 minute break off duty before performing which of the following tasks? There are times when you will be required to take a 30 minute break. If you have been on duty for more than 8 consecutive hours without at least 30 minutes off duty, you are not allowed to operate a CMV until a 30 minute break is taken. You may perform other on duty tasks but you cannot drive. Your 30 consecutive minute off duty break can be taken either off duty or in the sleeper berth. You may perform any and all on duty tasks without taking a 30 minute break except for any driving tasks. If you have been on duty (driving or not) for 8 hours without taking at least 30 consecutive minutes off duty, you must take the 30 minute break before performing any CMV driving tasks. Make sure you are familiar with the different rules you must abide by. The 11, 14, 60/70 hour clocks and the 30 minute break are very basic rules you'll need to follow everyday. If you do not understand them, you will struggle through the rest of this program. What does the 14 hour on duty limit mean? This limit is usually thought of as a "daily" limit, even though it is not based on a 24 hour period. You are allowed a period of 14 consecutive-hours of duty time after being off duty for 10 or more consecutive hours. The 14 consecutive hour duty period begins when you start any kind of work (performing vehicle maintenance, loading / unloading cargo, fueling, etc.). Once you have reached the end of this 14 consecutive hour period, you cannot drive again until you have been off duty for another 10 consecutive hours. Your driving is limited to the 14 consecutive hour duty period even if you take some off duty time, such as a lunch break or a nap, during those 14 hours. Example: You have had 10 continuous hours off and you begin working at 6:00 a.m. (vehicle inspection, fueling, loading / unloading freight, etc.). You must not drive your truck after 8:00 p.m. that evening. You may do other work after 8:00 p.m.(load / unload freight, perform maintenance duties, etc. ), but you cannot do any more driving until you have taken another 10 consecutive hours off. The 14 hour rule quite simply means that as soon as you begin working for the day, regardless of what time it is, you have 14hrs to complete your day. Once your 14 hours are up, you may not drive again until you have had a minimum of 10 consecutive hours off duty, at which point, your 14 hour clock will reset. After taking 10 consecutive hours off duty, a driver begins to work at 8:00 a.m. The driver may operate a commercial motor vehicle until what time? This limit is usually thought of as a "daily" limit, even though it is not based on a 24 hour period. You are allowed a period of 14 consecutive hours of on duty time after being off duty for 10 or more consecutive hours. The 14 consecutive hour duty period begins when you start any kind of reportable work (performing vehicle maintenance, loading / unloading cargo, fueling, driving, etc.). Once you have reached the end of this 14 consecutive hour period, you cannot drive again until you have been off duty for another 10 consecutive hours. While you are only allowed 11 hours of driving after taking a 10 consecutive hour break, you are able to complete those 11 hours at any point during the 14 hour limit. Is the following example within legal HOS limits? There are times when you will be required to take a 30 minute break. If you have been on duty for more than 8 consecutive hours without at least 30 minutes off duty, you are not allowed to operate a CMV until a 30 minute break is taken. You may perform on duty tasks but you cannot drive. In this hypothetical situation, a driver begins his day at 12pm. At that point, both his 14 hour on duty clock and 11 hour driving clock have started. 14 hour clock: 9 hours remaining (will be 8 hours remaining once his break is complete). 11 hour clock: 6 hours remaining (will remain 6 hours throughout his entire break). So, after the driver takes his 1 hour break, he still has 9 hours on his 14 hour on duty clock and 6 hours on his 11 hour driving clock remaining. Since he took 1 hour off duty, he now has 8 more consecutive hours that he can drive without taking a 30 minute break off duty. It has now been 5.5 hours since the driver took his break. So let's look at our remaining hours again. 14 hour clock: The driver had 8 hours remaining once he started driving again after his break and 5.5 hours have passed since then. The driver still has 2.5 hours remaining on his 14 hour on duty limit. 11 hour clock: The driver had 6 hours remaining after his break. He has driven an additional 5.5 hours since then. That means the driver still has 30 minutes remaining on his 11 hour driving clock. So yes, this driver is indeed legal! And once he takes 10 consecutive hours off, he can do it all over again.